For the English businessman, see Kevin Cash (businessman). 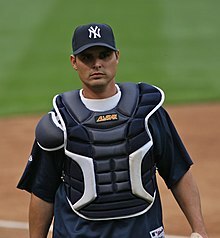 Kevin Forrest Cash (born December 6, 1977) is an American former professional baseball catcher and coach. He is currently the manager of the Tampa Bay Rays of Major League Baseball (MLB). Cash played in MLB for the Toronto Blue Jays, Tampa Bay Devil Rays, Boston Red Sox, New York Yankees, Houston Astros, and Texas Rangers. He was bullpen coach for the Cleveland Indians, before being hired as the Rays' manager in December 2014. Cash played for Northside Little League in Florida when they made it to the Little League World Series in 1989. Cash played college baseball for the Florida State University Seminoles under head coach Mike Martin. He batted and threw right-handed. In the summer of 1999, he played for the Falmouth Commodores of the Cape Cod Baseball League. Played in College World Series 1998 and NCAA Runner-Up in 1999 at Florida State. Cash played 101 games from 2002 to 2004 with the Toronto Blue Jays, mainly as a backup and defensive replacement. Cash joined the Devil Rays in 2005. On April 5, 2006, the Devil Rays designated Cash for assignment, and after clearing waivers, reported to Triple-A Durham where he spent the entire 2006 season. Cash signed a minor league contract with the Boston Red Sox on January 24, 2007. On August 17, 2007, Red Sox backup catcher Doug Mirabelli pulled a calf muscle rounding third base in the first game of a doubleheader against the Los Angeles Angels of Anaheim. Cash was flown to Boston from Ottawa (where the Pawtucket Red Sox were playing the Ottawa Lynx) to catch in the nightcap of the doubleheader. He made it to Fenway Park after the game had started. He started the game on August 19 against the Angels. On November 2, 2007, Cash opted for free agency after refusing to accept an outright assignment to AAA Pawtucket. On December 13, 2007, Cash re-signed with the Red Sox to a minor league contract and an invitation to spring training. On March 25, 2008, Cash's contract was purchased. He acted as the personal catcher for knuckleball pitcher Tim Wakefield after Doug Mirabelli left the Sox. He was also notable for wearing his plastic catcher's cap forward (similar to how a field player wears a normal baseball cap) under his mask; normally, catchers will turn the cap around to provide stability for their mask. In Boston, Cash wore the uniform number 36, except from August 16, 2008 to the end of the 2008 season, due to Paul Byrd's joining the Red Sox and wearing his customary number 36. During this period, Cash switched to number 30. On December 12, 2008, Cash was non-tendered by the Red Sox, officially making him a free agent. On December 23, 2008, Cash signed a minor league deal with the New York Yankees with an invitation to Spring Training. He began the 2009 season with the Triple-A Scranton/Wilkes-Barre Yankees. On May 8, Cash was called up due to injuries to both Jorge Posada and José Molina. He was optioned to AAA Scranton on May 29 and was placed on the injured reserve list after undergoing surgery to repair a torn rotator . Released by the New York Yankees' organization on September 5, 2009, Cash announced his retirement from baseball. However, he soon changed his mind, and on January 22, 2010, Cash signed a minor league contract with the Houston Astros. On May 5, 2010, Cash was called up to the Astros to replace a struggling J. R. Towles. He had 11 hits in 54 at bats with Houston. On July 1, 2010, Cash was acquired by the Red Sox for Ángel Sánchez after Jason Varitek went on the disabled list. As the backup catcher for the Red Sox for part of the season, he had 60 at bats and a .133 batting average, compiling just eight hits with the team. He finished the year with .167 average (AL and NL stats combined). He refused a minor league assignment on October 12, and became a free agent. He signed a minor-league contract with the Texas Rangers on November 11, 2010, and played the entire 2011 season at their Triple-A affiliate in Round Rock. On January 8, 2012, Cash announced his retirement. He was announced as an advanced scout for the Blue Jays during the 2012 season. Shortly after the 2012 season ended, Cash joined Terry Francona's staff with the Cleveland Indians as their bullpen coach. Cash played for Terry Francona during his stints with the Red Sox, and joined fellow Red Sox alumnus Brad Mills, who became Cleveland's bench coach. Mills was Terry Francona's bench coach while Cash played for the Red Sox, as well as Cash's manager with the Houston Astros in 2010. While in Cleveland, Cash recommended Yan Gomes to Chris Antonetti, the team's general manager. On December 5, 2014, the Tampa Bay Rays hired Cash as their manager, succeeding Joe Maddon. In 2015 he was successful on a lower percentage of replay challenges than any other MLB manager with 10 or more challenges, at 31.5%. Cash is the nephew of former MLB player Ron Cash. He lives with his wife Emily and their two daughters and son in Hillsborough County, Florida. ^ Lefort, David (August 17, 2007). "Ellsbury in Game 2 lineup". boston.com. Retrieved 2007-08-17. ^ Lefort, David (December 12, 2008). "Sox don't tender contract to Cash". The Boston Globe. ^ Sherman, Joel (December 23, 2008). "Yanks Sign Cash To Minor League Deal". New York Post. Archived from the original on December 25, 2008. ^ Cafardo, Nick (January 8, 2012). "Good starting point for Red Sox is 200 innings". The Boston Globe. ^ Bastian, Jordan (October 31, 2012). "Familiar faces among Francona's coaching staff". MLB.com. ^ "Kevin Cash". Baseball Reference. Sports Reference LLC. Retrieved May 17, 2016.